!Women Art Revolution :: Movie Information :: RabbitTV GO! For over forty years, director Lynn Hershman Leeson has collected hundreds of hours of interviews with visionary artists, historians, curators and critics who shaped the beliefs and values of the Feminist Art Movement and reveal previously undocumented strategies used to politicize female artists and integrate women into art structures. 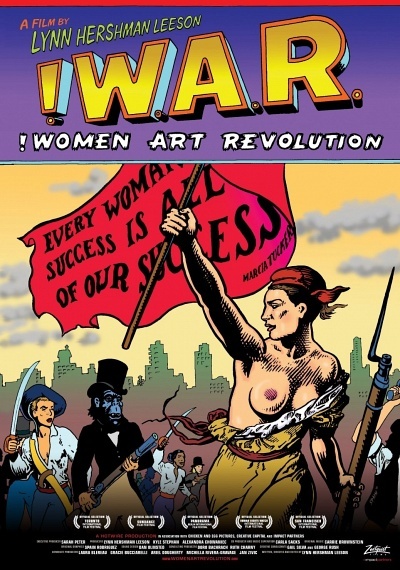 !WOMEN ART REVOLUTION elaborates the relationship of the Feminist Art Movement to the 1960s anti-war and civil rights movements and explains how historical events, such as the all-male protest exhibition against the invasion of Cambodia, sparked the first of many feminist actions against major cultural institutions. The film details major developments in women's art of the 1970s, including the first feminist art education programs, political organizations and protests, alternative art spaces such as the A.I.R. Gallery and Franklin Furnace in New York and the Los Angeles Women's Building, publications such as Chrysalis and Heresies, and landmark exhibitions, performances, and installations of public art that changed the entire direction of art. New ways of thinking about the complexities of gender, race, class, and sexuality evolved. The Guerrilla Girls emerged as the conscience of the art world and held academic institutions, galleries, and museums accountable for discrimination practices. Over time, the tenacity and courage of these pioneering women artists resulted in what many historians now feel is the most significant art movement of the late 20th century.